Raising and processing: what results in pu’er? For those who lives in southern California, this is one opportunity you would not want to miss. I'm very excited and happy to announce the very first class of Pu-erh tea in LA if not the first in America!!!! Outline of class will be announced soon (once Jason comes back to town). Call 310-921-5282 or email tea@teahabitat.com for reservation. Limited seating only (20), reserve your seats early! Tea plantations among dense fogs in the morning. Fog is so thick in the morning, only take a few minutes to accumulate a drop of water. Facial for tea every morning! Ah, old arbor tea trees! They can be over 5 meters tall, hence difficult to harvest, climbing on branches and using ladders are the only way to access those precious leaves. Average of 3 pounds of finished products per tree, only one harvest annually in Spring. Picture is taken in Fall, there is not much leaves on these trees. High altitude old arbor trees don't grow much during fall. Only in natural organic habitat will parisitic plants grow on trunks of tea trees. You can be sure leaves from these trees are safe and delicious. Before I continue with "Get to know Phoenix Tea (3) - Naming", I did a side by side tasting of the 2 Huang Zhi Xiang flavor teas: Ao Fu Hou 200+ yrs old mother tree, Huang Zhi Xiang 50+ yrs old (early clone). 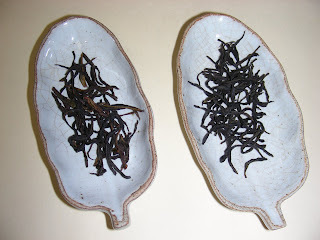 Dry leaves: Ao Fu Hou (left), Huang Zhi Xiang (right). Left (200) is mature, not uniformed, thinner but wider leaves, green with yellow bits. Right (50) is dark green, uniform in size and color, small strands. Tea trees reach its prime around 50 - 60 yrs old depending on the living condition, meaning leaves are meatier, more flavorful than younger trees. At sea level, tea tree will decline at 75 yrs old. 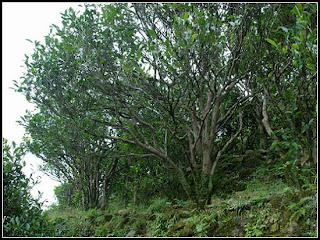 At high altitude, ideal living condition preserve tea trees longevity beyond prime years. However leaves grown slower, thinner, but ensure full flavor with silky texture, also tannin level is low, hence little to no astringency, hui gan is awesome. Left AFH is light amber, right HZX is light yellow in color. Spent leaves: main difference is in shape of leaves. 200+ yrs old tea: aroma is subtle and lingering through out the session, even long after drinking. Tea soup is creamy and milky, very smooth and full, the sweetness is quite pronounce, combined with the creamy texture, it's almost like drinking milk tea. 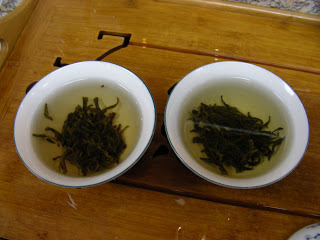 After 20+ infusions, flavor is not longer noticeable, but tea soup is still round, full and silky. My body started to respond to the qi shortly after just a couple infusions. 50+ yrs old tea: aroma is definitely more present than 200+ yrs old tea. Sweetness is more honey like, less creamy and smooth than its older counter part. It's very high in caffeine, in case you are sensitive to it. Both of these teas are powerful in qi. Phoenix Shui Xian is the official name for teas grown on the Phoenix mountain ranges. 1956 was the birth year of the name Phoenix Shui Xian, grouping all varietals on the Phoenix mountain ranges. In 1985, the government certified Phoenix Shui Xian as national premium tea varietal. Phoenix Shui Xian is not the same or related to Wuyi Shui Xian. Wuyi SX is a varietal with its own specific flavor. Phoenix Shui Xian on the other hand consist many varietals and flavors. The more appropriate comparison of the two would be Phoenix Shui Xian to Wuyi Rock, Honey Orchid to Wuyi Shui Xian. Phoenix Shui Xian in the old days were spread out amount the ranges of Phoenix mountain between 700 to 1100 meter above sea level. In modern days, tea plantations are everywhere including lower altitude hills. Here resides some of the oldest wild tea tree varietals, Hong Yin for example. It's hearty and rough in taste, not suitable for drinking when young. Locals store them for 30 years as medicine. Believe to have cooling property. Phoenix Shui Xian are small arbor trees, require intense and slow labor for harvesting. Phoenix Shui Xian traditionally were propagated by seeds, hence each tree is different from another due to mutation. Flavor is different, aroma is different, shapes and colors are different. Not wanting to mix the flavors together, the locals collect and process one tree at a time. Years of separation and experimentation, Dan Cong bushes are identified by its outstanding properties. There are 3 sub divisions from the main category Phoenix Shui Xian: Dan Cong, Lang Cai and Shui Xian by grade. Within each sub division, there are 4 more grades of each. Special grade, first grade, second grade and third grade. Each grade has 3 ranks. Total of 36 grade/rankings. For example, Lang Cai 3rd grade 3rd rank is better than Shui Xian special grade 1st rank. Dan cong 3rd grade 3rd rank is better than Lang Cai special grade 1st rank. 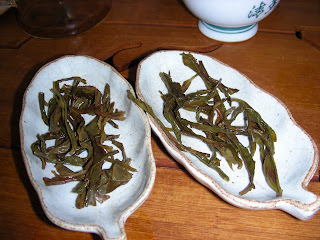 Shui Xian being the lowest due to the low grade of fresh leaves being used and processing of Shui Xian is also less cared for. The final taste determines what grade they belong to within the sub division. Lang Cai is better than Shui Xian by the same theory, better grade of fresh leaves were used, and processing is slightly more complicated during the fermentation step. Dan Cong being the highest grade due to careful selection from the vest number of Phoenix Shui Xian tea trees. Most of us already know Dan Cong means single bush. In the past, these single bushes were harvested and processed one tree at a time. Today, single bush processing is still very much practicing and strong, averaging 3 lbs production per tree. They just don't get to travel out of the country across the sea much if at all. Most of them don't even get out of Chao Zhou. You may wonder why there are so many DC out there for cheap. No, they are not fake, at least not from the ethical sellers. In modern days, cloning technology is widely used by tea plantations. The advantages of cloning is more than economical. The most important is preserving DNA of the single bushes, the aroma, the shape, the flavor of mother trees. But do not expect these new trees will taste exactly the same as the mother trees. Age of the trees also dictates the maturity and richness of the flavor. Older the wiser for human! Older the tastier for tea! Cloning does speed up propagation, and by doing so plantations can multiply its size at lightening speed, producing a lot of teas for commercial trading. Because the clones are coming from DC trees, they are marketed as DC as commercial products. It's a commercial product name, just like commercial Da Hong Pao. For defense of the name Dan Cong, there are true single processed bushes today. It's not a myth of the past. You just have to find it! We see phoenix tea, phoenix Dan Cong tea. What are the difference? 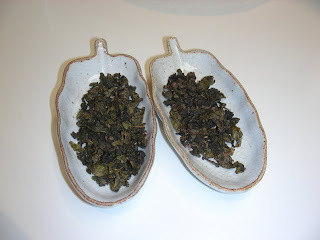 Dan Cong - Single bush as we understand from the name. However what is the true meaning of dan cong? In order to explain this, we have to travel back in time a few hundred years to get to know this fabulous tea. 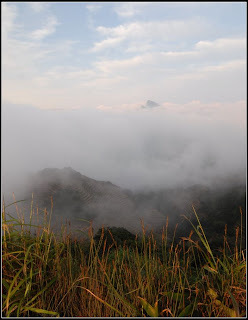 Why it is named Phoenix tea, why Dan cong, why shui xian (not to confuse with Wuyi shui xian)? Tea is confusing period, therefore phoenix isn't excluded. Let's travel down the corridor of history and sort this out. A mythical story often told by the locals of Chao Zhou, the last emperor of Song Dynasty Zhao Jing ran from the Mongolians traveling west from Fu Jian to Guang Dong, stopped briefly on top of Wu Dong mountain. Young Zhao Jing sat down feeling exhausted and thirsty. He asked for tea, but his servant replied where can tea be found on this foggy mountain top with no sight of a dwelling. He cried and kept asking for tea. Dense fog drifted apart, a phoenix appeared in sight with a branch in her mouth, she then dropped the branch by ZJ and flew off above rainbow clouds. ZJ picked up the branch, pondered, he plucked a leaf and placed it in his mouth. He shouted out "It's tea! It's tea brought by a bird's beak." He passed out all the leaves on the branch, leaving 2 husks. Inside the husks are 8 seeds. ZJ planted them on the ground, immediately 8 tea trees came to live, bloomed and fruited. ZJ was ecstatic, spreading all the seeds all over Wu Dong mountain. Tea trees were then spread all over Phoenix mountain range. The locals named it bird beak tea. It's also called Song Zhong - Song varietal. 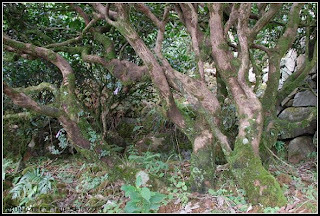 The oldest tea tree alive today on Wu Dong MT is over 900 years old. It's a white leaf Song varietal. The most famous tree on Phoenix mountain, however not very tasty. An other more convincing theory is phoenix tea leaf shaped like a beak from the side. It's up to you what you want to believe. 1, small commercial operation to change flavor, prepare for storage and/or aging. I speak of what I know, and what I know is not the only way, nor it is precise. However it's a learning process, it serves the purpose of what I try to achieve at this point. Of course my expectation of end result will raise as experience accumulates and that my skill improves along time. There isn't an exact way or formula to roast tea. The basics are temperature and time control. My way for initial roasting is using a semi commercial electric tea roaster, 80 C for 1 hr to warm up, depending on the type of tea (maturity and shape of the leaves, original roast and fermentation) and the final taste you want, turn up temp for actual roasting for any where between 30 min to 1 hr, temp can be anywhere between 90 to 110 c, then turn down temp to 70 to 80 for 5 to 8 hrs. It's now time to taste. I usually put aside some of it at this point if I am not satisfied with the result and proceed to another session of roasting. It's trial and error from this point on. I have burn some batches, under roasted some, and some came out quite nice but I still wonder if it could get even better. The key is as long as you did not mess up (burn) a batch, you can manage to make it better. Highest temp for re-roasting tea is not to exceed 110 c, unless you like charcoal flavor tea. Patience is virtue my tea friends. Bear in mind the bottom line is to decrease moisture for better aging, flavor is second to it. For fisted oolong, longer it takes at lower temp, because you do not want to burn the exterior while the interior still contain moisture. Roaster does not come with cover, I use layers of paper to cover opening. I will look for a bamboo cover soon. Above picture shows before and after roasting. Left is before, right is after. This is TGY of 07 which Will acquired from China in Oct. One of the medium grade TGY with typical green grassy flavor before roasting. Roasted TGY is slightly more brown than the original, but the difference is rather small. However the taste is much different. Roasted TGY lost most of the grassy taste, sweet roasted rice aroma is the new transformed flavor, much more palatable than the original flavor. The whole duration of roasting went on for about a week, with initial roasting (low, high then low temp) about 7 hours, another 4 hours (low) the next day, rested for 2 days, 1 hr (low) every other day for the rest of the week. Rice cooker must have "keep warm" function. You can roast 1 to 2 lbs at a time depending on the shape of leaves. Loose strands take up more space, hence less tea can fit in rice cooker pot. "keep warm" for 8 hours if you just want to loose excess moisture. To change flavor, "keep warm" for 1 hour, "cook" for 30 min to 2 hours depends on original roast, shape of leaves and how you like the resulting flavor, then "keep warm" for 6 hrs. Test result with tasting, repeat if desired more roasting. Do not cover with lid when roasting, cover entire pot with a few layers of clean paper free of odor. Moisture can escape through paper is the purpose. For greener teas, leave center open by creating a hole in the middle of the pile. If you try to change the flavor of tea by using high heat, please do beware the flavor will continue to transform for months after roasting. Here is an article I wrote a while back using a Yixing roaster. Ever since pu-erh market sky rocketed, it generates a lot of interest in aged tea. Aging tea is not a new invention and not limited to pu-erh. Aging tea is incidental for most, pu-erh and liu An are exceptions. New crops of green pu-erh and liu an are too raw for digestion. Why age teas while fresh is usually better? Well, supply and demand are rarely equal. Despite the demand for tea, particular quality teas has increased significantly, there are always unsold teas in any type. What do you do with them? Not much other than keep them around and let it age. China tea industry was at a historic low before mid 80's of last century. Hence you see more aged teas from that period of time. However they were gobbled up by the new middle class of new China in the last 10 years, pu-erh market shows how crazy this phenomenon has been. 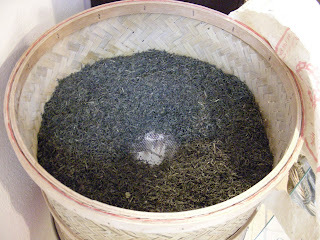 Tea stored for a long period of time are subject to moisture, mold, oxidation and pest depending on the condition. How to prevent tea from becoming rotten? Clean environment is a must, next is to keep moisture as low as possible and out of the container. 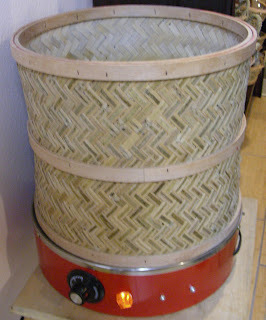 Roasting teas at low temperature will achieve the purpose, then stored in sealed container. Oolong, green and black teas are all ageble. What kind of tea is suitable for aging? Basically any tea. 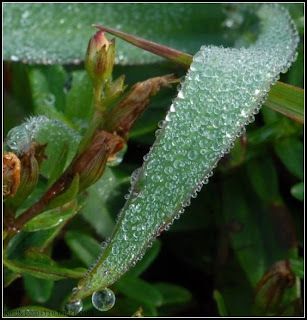 The fundamental requirement is keeping leaf moisture below 5%. Roasting is the key to preserve quality. Environmental influence is one of the elements to consider during roasting on top of the type of tea to roast, the resulting flavor you would like to achieve. Temperature and duration of roastings are key factors. Younger the tea leaves, lower temperature and shorter time. More matured leaves (more fiber) can handle higher temperature and longer roasting time. There is no formula for roasting, not even the same tea roasted in different days at same temperature and timing will end up with same flavors. We can attempt to not mess up a batch then let it evolve over time. That's why tea is so fun and never boring. Tea brings people together as a Chinese philosophy for thousands years, it will continue to bring new people and the familiar together for many more years to come in every corner of the world. Here in the southern corner of California, we carry on the tradition on a Sunday afternoon. 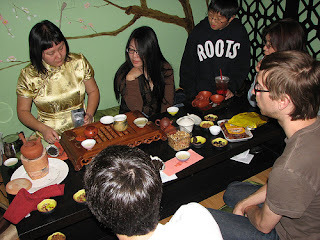 A few LATA members and tea enthusiasts frequent my shop got together for a session of tea tasting. Cha Xi (tea banquets) are often hosted here lately. Good teas are must, various types of snacks are also part of the feast. For a more complete documentation of this tasting, see Jason's story at pu-erh community. It's interesting how a typical Chinese banquet lasts a couple of hours, while a half day long tea banquet seems too short. It'll require a larger area to host events like this in the future. I am looking forward to Chinese New Year when family, friend and selected customers are invited to attend a huge tea party, celebrating the culture with tea, how appropriate! During the last tasting, we had a few interesting teas, and a few others we didn't have time to try. 86 vintage Dan Cong, 94 vintage Dan Cong, not sure if we had the 96 Wu Dong Da Ping DC, Chuan Du Lao Ming Cong - courtesy of Danica, Bor Tou - ginger flower. I had to part from the tasting for business issue while tea tasting continued. 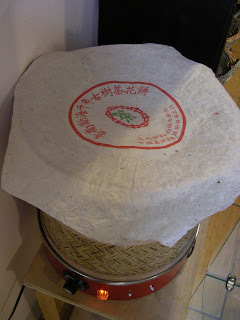 Chuan du lao ming cong was sold out without any reserve shortly after its arrival. The few sessions of this tea I brewed varied from time to time. It was the most difficult tea to brew out of all the teas I had. At one point, I was quite disappointed, until I looked further into the "moodiness" of DC. During the latest gathering, I made a special request to Danica to share some of her stash of this tea, brewing with all Chao Zhou tea wares, from pots, to stove, to water boiling pot, to olive pit charcoals. The result was not satisfying either. The challenge was on and would not be settled until I could maximize its potential. I have confidence in the potential of the tea, it just takes all the right elements to bring it out, perhaps I'd have to wait till full moon?! Will came by the next day (Monday), and generously gave me shares of his stash. I roasted the leaves at 80 degrees C for 30 minutes before brewing, the intense floral flavor came out again, honey smooth texture reminded me one of the previous successful session, but more smooth and mellow. I love Dan Cong, not only because its beautiful aroma, distinctive flavor, the beauty of Phoenix mountain, or just because it's originate from the soil where I'm familiar with. What made me partial to them is its unpredictable nature, its complexity, and the hidden quality of its beauty. It takes patience to discover those qualities, it takes practice to unveil its potential. It's a challenge that drives me to learn, to search, to bring out the best of these little leaves.